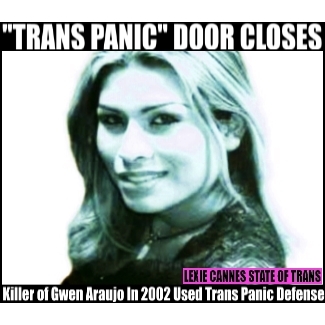 LEXIE CANNES STATE OF TRANS — UPDATE – Sept. 29, 2014: As reported in this space last month, the California legislature sent to the governor’s office a bill that banned the usage of ‘trans panic’ as a defense for physical harm inflicted on trans people. Today, we have word from The Advocate that Gov. Jerry Brown has signed the bill into law. Brown also signed the Respect After Death Act – a bill that will help transgender people receive properly notated death certificates. (Original article, August 29, 2014) On the heels of the American Bar Association’s recent call for states to ban “trans (and gay) panic” defenses in court, the California legislature passed such a bill and it’s already on its way to Gov. Jerry Brown’s desk for him to sign. This would make California the first state to ban this practice. The trans panic defense has been use by criminals to excuse their behavior when engaging in romantic or sexual activities with transgender partners. This often results in a conviction of a lessor charge or complete acquittal. The murder of Newark, California trans woman Gwen Araujo in 2002 is an early notable case of the trans panic defense being applied. She was killed by four men after their discovery she was transgender — none were convicted of hate crimes. While California is just the first state, a precedent has been set. Before long we’ll see dominos start falling. Well it’s about time. Too bad the bastards that murdered Gwen got away with it. I hope that they suffered from the time in jail that they spent, and will still continue to suffer emotionally. It’s so dumb that we even need a law banning such a stupid defense! Some rich kid got of killing someone by his lawyer claiming he was afflicted with affluenza (having so much wealth that he was incapable of controlling his responsibility for his actions which led to the death of another person). The judge bought the plea and gave a paroled with no time behind bars sentence. About time – thanks for blogging, Lexie. The real tragedy is that it was ever accepted as a defense for killing someone. Lets hope this comes to michigan. I am FTM and go through harassment and discrimination daily. The lovely government of ours needs to realize that WE ARE PEOPLE TOO. Our personal choices have nothing to do with anybody else, and we shouldn’t be ashamed or be embarrassed or have to hide who we are because of the ideas of “conservative society” . The same happened with womens rights and interracial couples. People are people and take that to my grave.